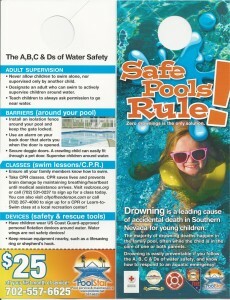 PoolStar™ sponsored “Safe Pools Rule” Henderson firefighters. 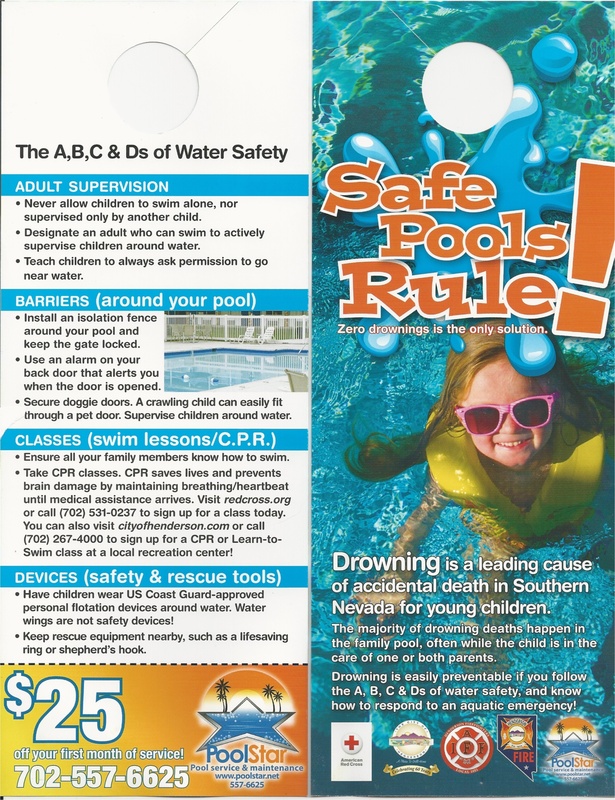 PoolStar™ was the proud sponsor of the city of Henderson and the Henderson firefighters “Safe Pools Rule” campaign for 2014. The campaigns main objective was to make aware the A,B,C & Ds of water safety. They are all listed below on the 8k door hangers that were distributed within Henderson by the American red cross, life gaurds and Henderson firefighters when they did a mass walk and knockathon locally promoting pool safety. “Tragically, pools are the first or second leading cause of death in young children,” said Henderson firefighters Dan Pentkowski. Pool service can help towards pool safety insuring the water is clear and safe to swim in. This entry was tagged swimming pool safety, Henderson swimming pool service safety, Safe pools rule. Bookmark the permalink. ← At PoolStar™ customer service is the top priority.